For Our Babies paints a bleak picture of how societal changes in the United States over the past 60 years have affected babies. Today’s infants and young children have less access to their parents, spend longer time in child care, and receive substandard child care and services. Written by J. Ronald Lally, Co-Director of the Center for Child & Family Studies at WestEd, the book shares the hopes, worries, and frustrations of American parents, who receive little support for their children or themselves as parents. It also reveals their lack of awareness about how little assistance they receive compared to parents in other countries. In addition, the book provides crucial testimony from developmental psychologists, child care providers, health and mental health professionals, economists, specialists in brain development, and early learning educators. These specialists address how U.S. policy and practices must change if all parents are to raise children to be physically and emotionally healthy and productive members of society. To learn about WestEd’s For Our Babies initiative, visit ForOurBabies.org. Carol Brunson Day, President, Brunson Phillips & Day, Inc. This revised edition of the best-selling Caring for Infants and Toddlers in Groups: Developmentally Appropriate Practice provides the latest information about the elements of quality care that support optimal development and learning for young children. 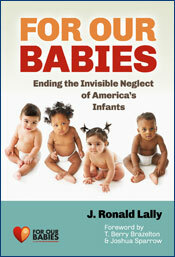 J. Ronald Lally of WestEd's Center for Child and Family Studies served on the board that reviewed this book.